There are some photos that take me back to another time and place. A time of learning, playing and growing up. Recently, I scanned in some photos that bring back my teenage years spent at my Dad's house. 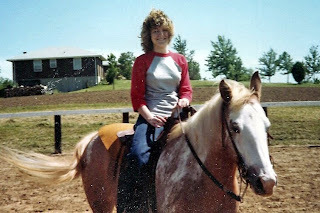 These photos not only show my love of animals, especially horses, but it reminds me of all the hours of fun, playing and learning that we experience with our beloved horses. Dad got Sherri and I Sugarfoot, and then Sugarfoot gave birth to Candy and Taffy. Dad taught us not only how to ride, but the love of a horse. Sherri and I rode and groomed these beautiful horses for hours. Our cousin, Chris, would also join us on occasion. Those were carefree weekends and summers that we spent together. 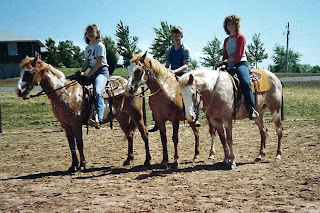 I miss those times, and our horse friends that shared in our experiences of growing up. Thank you Dad for sharing your love of horses with us. Ally would have loved your teenage years. Me too! What girl wouldn't?